Diana, the Roman Goddess was known by many names including Queen of Heaven; the Great Goddess; Lunar Virgin; Mother of Animals; Lady of Wild Creatures; and the Huntress. Diana as the Roman Moon-Goddess was originally worshipped on the mountain Tifata near Capua and in sacred forests. Later she was given a temple in the working-class area on the Aventine Hill where she was mainly worshipped by the lower class (plebeians) and the slaves, of whom she was the patroness. She is often depicted carrying a bow and arrow and wearing animal skins or accompanied by animals. When the Greek city of Ephesus fell to Roman rule, Goddess Diana was merged with the Greek Goddess Artemis. This is most likely due to the fact that around the time of the Roman empire, Romans would allow the places they over took to continue worshipping their own Gods and Goddesses, incorporating those Goddesses into the Roman Pantheon. 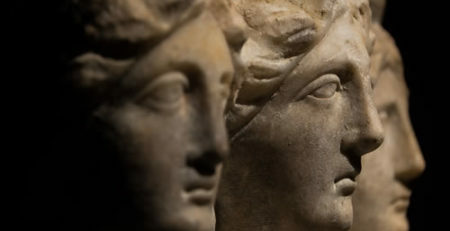 Artemis and Diana were worshipped at the same times historically and when the Great Greek Temple of Artemis was destroyed the Romans rebuilt it in honor of Diana and the myth of Goddess Diana of Ephesus began. Stories of Goddess Diana are told from the beginning of Troy to the Christian Bible of King James in the scriptures of Acts and the gospels of Paul. Acts|19:27 So that not only this our craft is in danger to be set at nought; but also that the temple of the great goddess Diana should be despised, and her magnificence should be destroyed, whom all Asia and the world worshipped. The multi-breasted statue of Diana at Her Temple in Ephesus displayed her capability to nourish all creatures and provide for them. Worshippers adored Goddess Diana so much that the only way the Christians could rid the people of their Goddess was by assimilating her into their new religion. Thus Ephesus became a place of Mary, Mother of God. The church even invented stories of Mary living at Ephesus and being entombed there. In Babylonia, and in the nation of Assyria, she was known as “ISHTAR” The Phoenicians called her “ASTARTE”. The Israelites knew her as “ASHTORETH”. 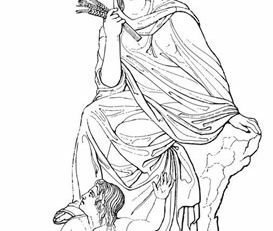 Diana was also the goddess of the Latin commonwealth where She rule with Her brother Lucifer. Lucifer being a Latin word for “Light Bringer”. In Italy the old religion of Stergheria embraced goddess Diana as Queen of the Witches. Witches being the wise women healers of the time. Goddess Diana created the world of her own being having in herself the seeds of all creation yet to come. It is said that out of herself she divided into the darkness and the light, keeping for herself the darkness of creation and creating her brother Lucifer, the light. Goddess Diana loved and ruled with her brother Lucifer, the god of the Sun and Moon. As time went on, the Earth was created and Diana descended to Earth, as did her brother Lucifer. Diana taught magick and witches were born. One night using witchcraft in the form of a cat, His most beloved animal, Diana tricked Lucifer. She gained entrance to His chamber where She seduced Him. From this union a daughter was born. Goddess Aradia. In other versions of this myth we find the similarities the Christian tales take as their own in attempts to dispel the Goddess. The first being, Lucifer who is so proud of his beauty, and who for his pride is driven from the Paradise of Goddess as is the tale of Lucifer falling from Gods grace. The second being Goddess Diana also sends Her daughter Aradia to live as a mortal and save the misfortunate people of Earth as does God send His son Jesus to live as a mortal and save the people. As pagans my sisters, Goddess Diana is the eternal Mother of all creation, the first that is and the last that will be. She is the Huntress of the forest seeking means of survival. She is the call of the wild, the beating heart of the forests, the animal spirit within, urging us to remember our origins. She awakens nature within us that we remember to feel the rustling wind through our hair, to hear the howling of a wolf or the echo of a voice in the forest. Goddess Diana calls to us to let our animal essence out and hone our inherent sensibilities. Dance and sing to the moon, run until our heart pounds to the top of a hill, to take a swim in a creek, roll around in the grass as we once did as a children, or just gaze upon the stars in wonderment; knowing all the while that Goddess Diana is within us, sharing our journey. As with the Christian invasion into the old religion , we too are told as women what is right and wrong. We are told what is the correct thinking to blend into a society that denies us our truth. Not tonight my sisters, tonight we pray to the Goddess Diana that you never forget the wonders of creation, the joy of being alive, and the importance of being a woman. Tonight we pray to Goddess Diana to be filled with Her strength to survive the challenges that would steal our dreams. under Her Full Moon we are alive in Her reflection. As a Circle of women we pray to Goddess Diana to grants us development and change within ourselves. As we embrace Her energy that is the vibrations of the universe that lives within us let the hunt begin. Let us seek out and tame the resources that is the beast and the forest of our lives. As goddess Diana let us be the huntress of our path. Tonight as women we say “Great is the Goddess Diana and Great is the Goddess in Me”. Wow, so I guess that make Diana and Lucifer the top dog ha? No wonder Christianity try to make her the ultimate evil. Although, I would recommend you read the whole book of revelation within the bible. An interest fact you would find is that, Satan is actually the good guy and the Christian god Yahweh, is actually the bad guy, the bible just present a distorted idea of good and evil, and right and wrong. A more interesting fact is that the image of Satan here is actually in coalition with Ishtar. Basically, the whole story is Yahweh come to declare war on the world accusing people for been evil for not worshipping him as one and only true god and kill, kill, kill and then Satan raise up to lead men to fight against Yahweh’s army. So, the bible accuse Satan and her follower to be evil and the two army have a massive show down. Beautiful. Long live the Goddess within us all X.